"The Aztecs believed that cacao seeds were the gift of Quetzalcoatl, the God of wisdom who was hated by the other gods for giving cacao to humans. The seeds had so much value they were used as a form of currency. Originally prepared only as a drink, chocolate was served bitter and spicy. Often this gift from the gods was reserved for royalty and religious leadership. It was believed to give strength and so was added to a soldier's rations. Later it was seen as an aphrodisiac which made it much more popular. 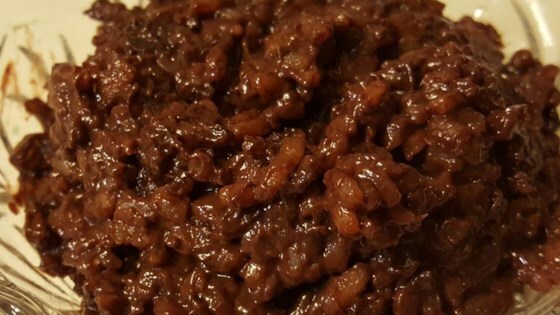 I have used their spirit as inspiration for this sweet and spicy rice pudding." Combine water, rice, and cinnamon in a large pot; bring to a boil. Reduce heat to medium low, cover pot, and simmer until all the water has been absorbed, about 20 minutes. Mix milk, sugar, cocoa powder, cayenne pepper, and vanilla extract into rice mixture, increase heat to high; cook, stirring constantly, until thickened, 5 to 10 minutes. Remove pot from heat and pour pudding into a large glass bowl; let sit for 30 minutes before serving. For a special sacred experience, double the cayenne pepper (2 tablespoons) and reduce the sugar by half (1/2 cup). Enjoy it the way the Aztecs would have! For best results, cover and refrigerate overnight. I'm not used to hot desserts, so this took a while to adjust! I don't think I will ever be ready for the sacred experience of doubling the pepper!!! This was easy to make. I only used 1teaspoon of cayane pepper and it was still to hot for me and I eat jalapeños. I would make again and just leave out the pepper. Great recipe with a twist. I only added a 1/4 teaspoon of cayenne pepper and was plenty of heat. Excellent. I used half of the called for cayenne. Gives you the pepper and makes you search for the cocoa!